Are you frantically running around, trying to wrap last-minute gifts? Hopefully the project I'm sharing today will help with some of your wrapping needs. Target sells adorable gable boxes by Spritz. They come in a bunch of different colors and patterns and they're super fun to decorate for any occasion. I altered this one with Echo Park's Home for the Holidays collection. 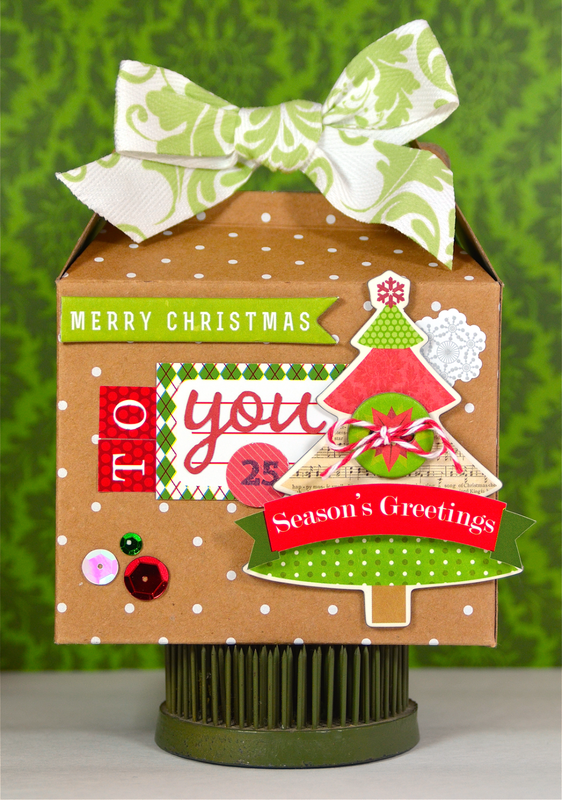 Just a few pieces of chipboard, some stickers, sequins and a bow and you're good to go! If you'd like more information about this project, please visit the Echo Park blog. Thanks for visiting today and happy wrapping! Love love love this! LOVING the colors and that tree!! Gonna have to check out Target and get some of these!!!!!! That is soooo adorable and fun. Adorable gift box. LOVE the embellishments you chose!! I do have last minute gift to wrap for the teacher... Thanks for this beautiful inspiration ! So fab Lisa!! Love the cute bow, at the top of your box! Such an awesome project, Lisa! I thought i had commented on your adorable gift box, but I guess I looked but didn't comment, sorry about that.